Are you part of a professional association? If not, this in itself might be telling. Fewer people are joining professional trade groups these days because information is more available than ever through other sources, including, of course, the internet. The face of professional associations also is changing. In October, our topic of the month was how to recruit members and volunteers to professional communities such as ASQ. Why join? John Hunter discusses the value of professional associations, finding that career opportunities and open-access information are two of the most valuable aspects to joining. Rajan Thiyagarajan says that networking is still the major benefit offered by associations. And Anshuman Tiwari writes about how ASQ can become more influential and relevant to India’s quality professionals. 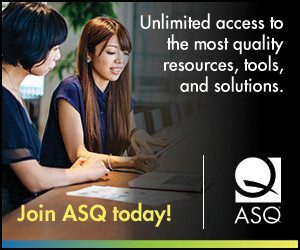 Edwin Garro blogs about how ASQ can become more relevant globally. Lessons learned: Bob Mitchell looks on his own experience in volunteer and member recruitment as part of ASQ’s statistics division and the Minnesota section. Lotto Lai writes about how the Hong Kong Society for Quality successfully increased its membership and engaged members. Scott Rutherford looks to how religious organizations make themselves relevant in today’s society and provide value to believers. Aimee Siegler writes about the importance of training, and finds a good example of this in the Girl Scouts, an American youth organization for girls. And Dan Zrymiak looks to Toastmasters, a public speaking and leadership organization, for inspiration. Tips for associations: Jennifer Stepniowski offers a variety of ideas for recruiting and retaining members, including organizing an appreciation event or placing an ad in the local business paper. Babette Ten Haken also shares tips for associations, including the basics, such as making members feel welcome. Manu Vora discusses member and volunteer recruitment from the HR perspective. And Jimena Calfa writes that professional groups must now exceed, instead of just meet, the expectations of their members. There are lots of options these days. Associations, like other businesses, must be the best in the market to succeed. Previous Previous post: Is Every Quality Professional a Leader?